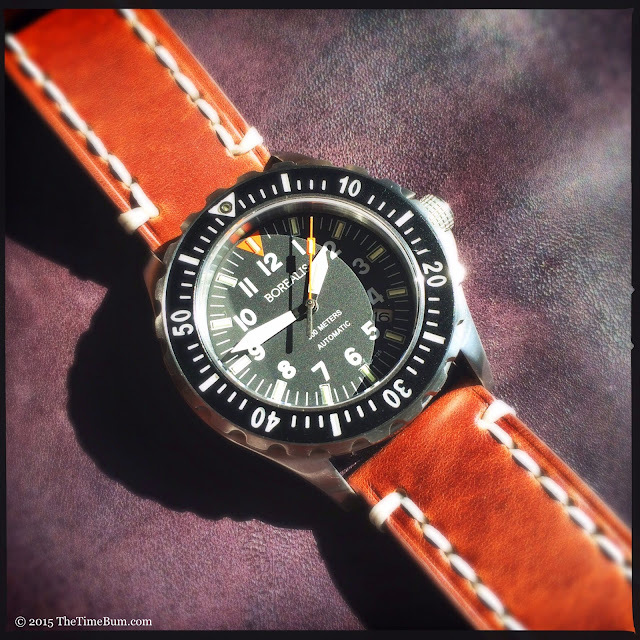 Panatime has always offered a great selection of straps, and lately they have been working overtime to add cool new products to their inventory like the Tobacco Collection. 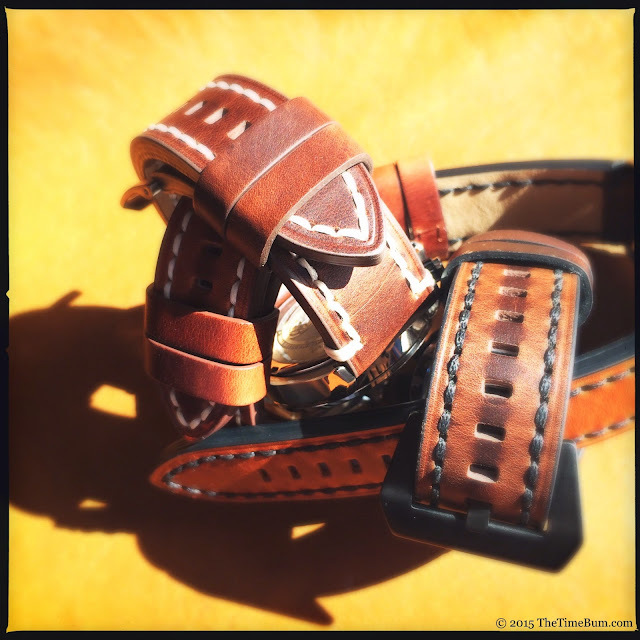 These straps are made with thick vintage leather with a distressed finish and a Bum friendly price of $49.99. 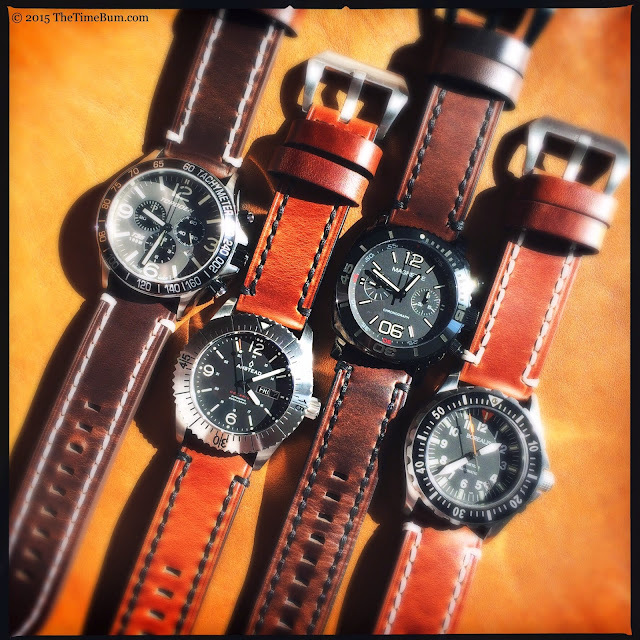 For this review, the folks at Panatime sent a set of four 24mm straps: brown and dark brown, with black and white stitching. 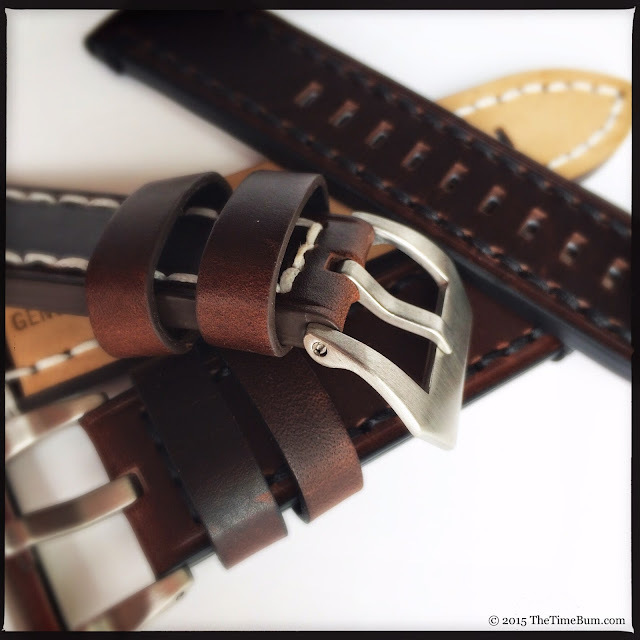 The straps are available in even sizes 18-26mm and three lengths. Thickness and lengths vary by size. 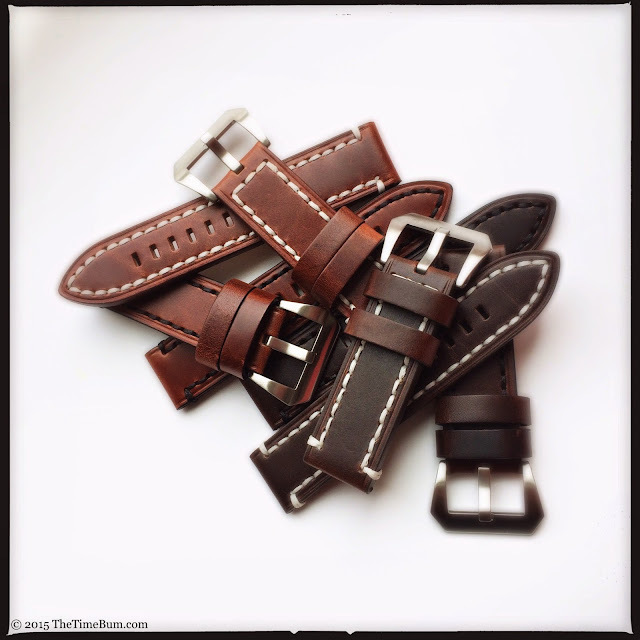 The standard length straps I evaluated measured 5mm thick, and 125/75mm long. They do not taper and have straight stitching that is open at the lug ends with a side stitch. The sides are painted. They have two floating keepers. Buyers may choose from high-quality Pre-V or ARD curved frame stainless steel buckles in brushed, polished, or PVD black finishes with attachment bars that screw directly into the frame. It is a solid arrangement that is still easy to remove and replace. The review samples came with brushed Pre-V buckles, but I dug into the strapped drawer and swapped a black Panatime buckle onto one of them. Fresh from the envelope they display deep color, a somewhat oily sheen, and an even tone with faint hairline creases where the leather has puckered under the hole punch. They look great, if not particularly vintage. That changes when you put it on. A pronounced pull-up effect occurs where the leather is stressed, revealing the grain and creating variations in color and tone. The brown color has a red tone that goes from a deep chestnut to almost a British Tan in direct sunlight. The dark brown is rich and earthy and reacts dramatically when bent. 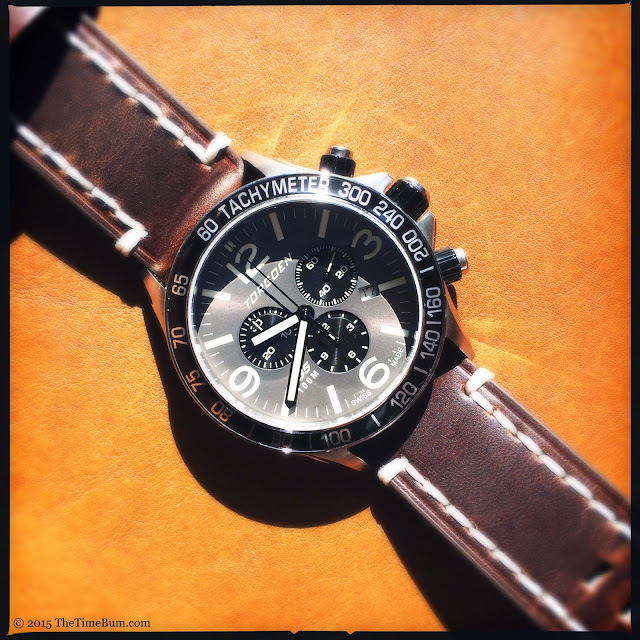 These beefy straps look best on heavy watches. 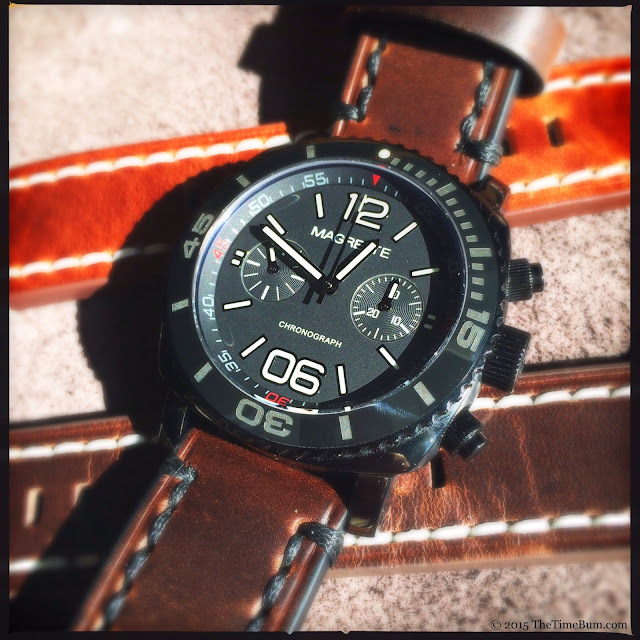 I tried them on my Anstead Oceanis, Borealis Scout Sniper, Torgoen T35, and Magrette Moana Pacific. As you can see, they work beautifully. 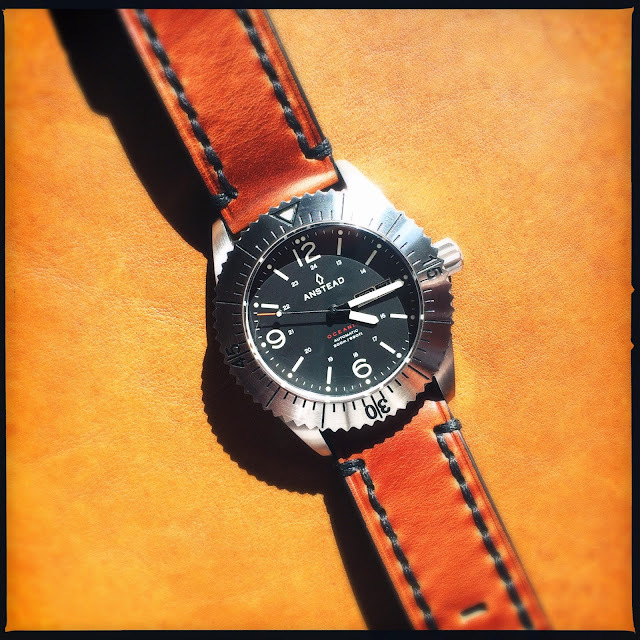 I was pleased to find that although the straps are very thick, the leather at attachment bar holes is much thinner, enabling a proper fit on watches like the Anstead and Borealis that have very little clearance between the case and spring bars. Thick as they are, the straps are not overly stiff but are quite pliable and comfortable. Proper fit is always a concern on my small 6.5" wrist, but with nine adjustments I found a perfectly fit with holes to spare and without much excess tail. 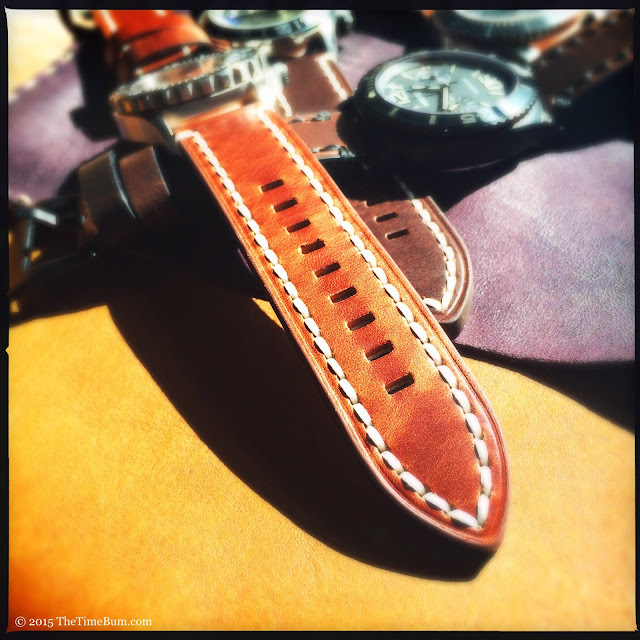 Given the wide range of adjustment and three sizes to choose from, I believe there is a Tobacco strap to fit just about every wrist. Overall, I was extremely satisfied. The straps are well constructed with solid hardware and a marvelous finish that should gain character with age. For about fifty bucks, the Tobacco straps will be a fine addition to any collection.